TFW they’re still doing it: squeeeeee the local Republican autodefenestrations continue! 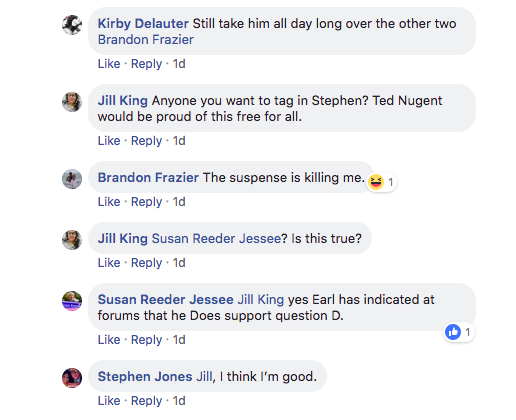 Kirby Delauter’s Facebook page has it all. Man these people are excellent at making themselves look insane on social media. This would be a good time to remind everyone not to vote for Cindy “F Your Feelings” Rose. Honestly, there is so much packed into this Mexican standoff, it is hard to limit ourselves. 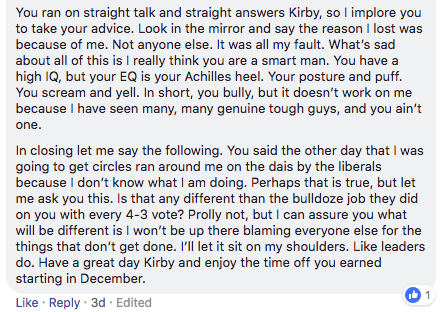 It’s a public post on Kirby’s page, if you’d like to do your own rubbernecking. 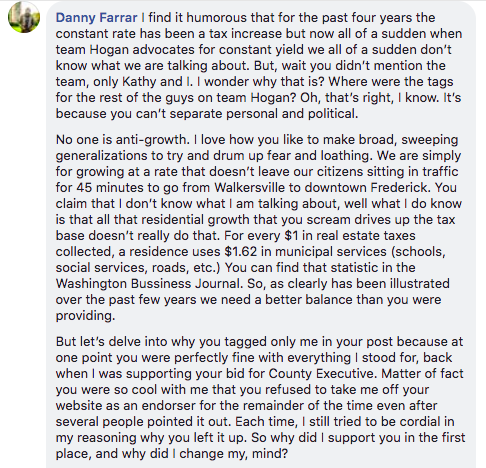 Danny Farrar immediately rebuts, in a post approximately as long as that horrible David Foster Wallace novel that we have mercifully forgotten the title of, and things go downhill from there. You mean to write, “…only Kathy and me…” Oh toss it all, we aren’t going to start editing for another one of these dingbats. You can see how the factions are aligning. It’s a shame, really, that Danny (according to some people we know) used to slobber all over Billy and Kirby at SoldierFit, to the point that the egregious sycophancy caused them to discontinue patronizing Danny’s business and NOW LOOK! Was it worth it?! Now he’s in a big, undignified “you throw all your friends under the bus” spat with him. 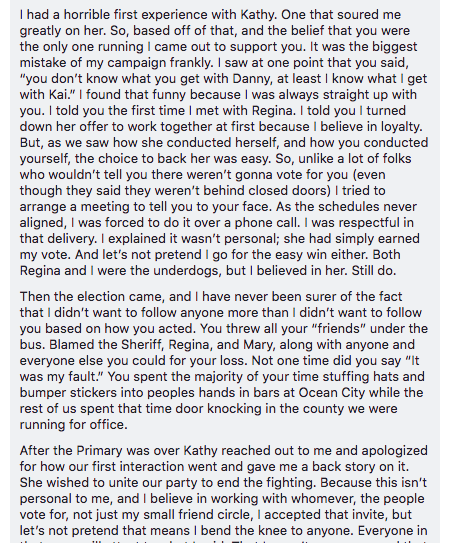 And Danny is sure not wrong here, but…this is also as undignified as a Young Family Facebook Reunion. Is he questioning Kirby’s manhood? It kinda seems like he is questioning Kirby’s manhood…lol, we approve of this. 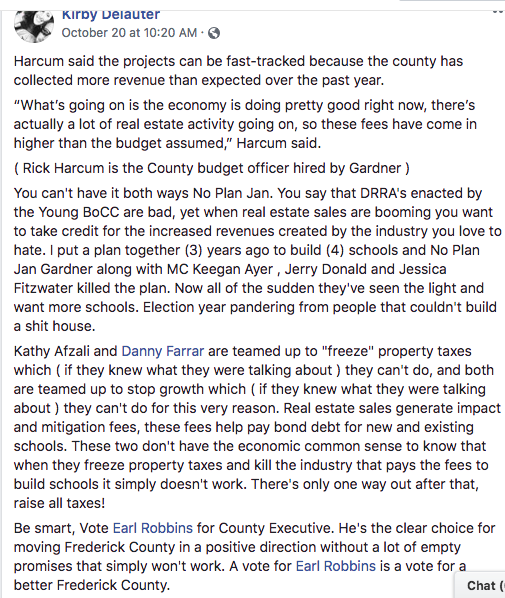 Still, don’t vote for Danny Farrar. We have candidates who can discern a low IQ when they see it. I mean, only one of our council members has been ridiculed by the national media for his stupidity…and that one is Kirby. When you think about the superlative stupidity contest, that is pretty bad. 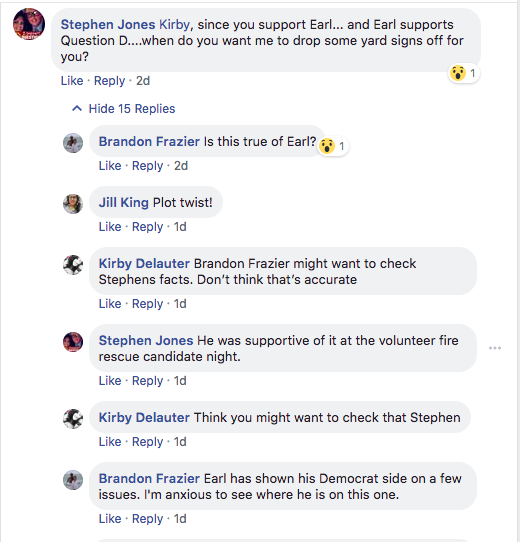 Oh here’s some solid evidence of the low IQ thing: Kirby’s anointed County Executive candidate in disagreement with Kirby and all his friends on their hot button issue! And, there it is! BWAHAHAHAHAHA. Seth Eisenberg chimes in to defend Kirby and chastise Danny (random thought that just occurred to us: why are grown adults named Billy and Danny in this county?). Please someone sit Seth down and explain how “you’re” is a thing. His contributions are lame, and he manages to look dumb in content, contribution, and composition. The Cindy/Mary spat has been a wonder to behold. 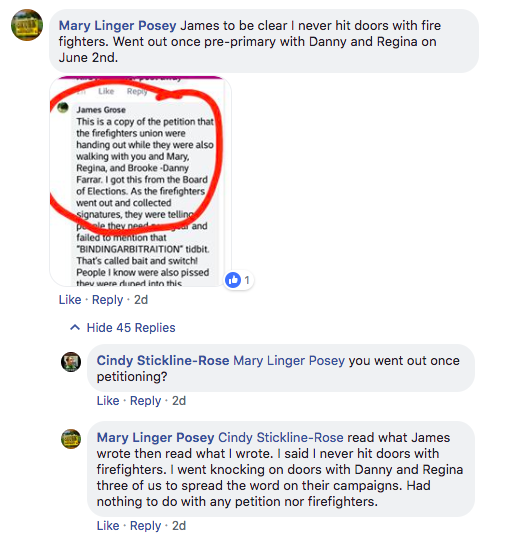 Cindy Rose (Worst and Most Often Failed BOE Candidate Forever) and Mary Posey’s spat dates back to an earlier episode, which caused the Republican Club of Frederick County to lock down their page. We like to call that winning! We temporarily quarantined some terrible ideas, thereby depriving us of all the pointing and laughing that Kirby’s page has resuscitated here. It’s amazing how she is always trying to be deliberately obtuse for the purposes of gotcha. And what a dumb argument for her to get involved in. Being disagreeable is her hobby. Like the candidate may not have been out for days on his own…oh well, whatever. 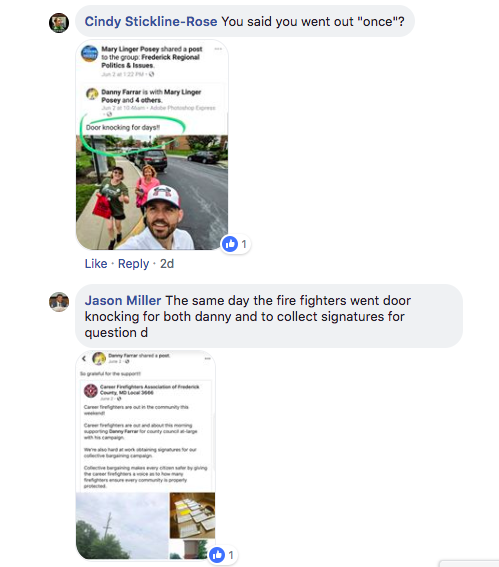 We skipped all the back and forth with Danny about “binding arbitration” and whether he is with or against the firefighters and it does kind of seem like he’d rather not be for or against it. This issue has been really interesting to see from all sides. One observation we have come away with: people we used to think were way out there don’t even crack the Top 10 Farthest Out There in This Neck of the Woods. We do apologize for our earlier harsh judgment. 9 more days until voting starts! What’s been going on around here anyway? Sorry, Tiger, hopefully everyone who can vote will! Ah, first of all the only candidate who has received any benefits is the only one that has been elected to the office. So, how can it possibly be all of them? That makes zero sense. Let’s delve a little deeper into this though. Do we really expect people who work full-time in a political office not to be compensated for their work? Or, perhaps Kirby is one of those elitists we keep hearing about that believes that only those who are independently wealthy should hold political office. Guess who else has worked close to 8 years as a politician? That’s right Kirby. And he wants 4 more! What is with him and Kirby and the double negatives? Well, we give this guy a triple negative endorsement! How do you like them apples? The Wonkette, one of our favorite blogs, did a couple of great pieces about him a few weeks back. If you missed the New York Times article about this fella, take a gander. He believes not only in the patriarchy, but that women should be in enforced monogamy with men! Why, you ask? Well, if not men will become violent, like all those disgusting incels you’ve been hearing about lately. And who is to blame? The man? No, no, no! According to Jordan Peterson women are! Sanctity? When is she going to leave the transgender population alone? You are the company you keep fellas! Wait, I thought they weren’t a slate! We don’t rubber stamp every Democrat that comes down the line, nor do we rally against every Republican (Vote Steve McKay in District 2 if you are voting in the Republican primary!) Click here and here to read what we think about Galen Clagett. Trone does not have the backing of your Lady Yokels. We know there are more candidates that we need to bring attention to, but this is all we have the time and energy for today. If you know of any other stories that need to be shown the light of day, do not hesitate to put them in the comments for all to see! Let’s paddle all those brain washed kids! Your BoE election week in review! We can barely keep up with this year’s slate of BoE candidates! We shared quite a few of Cindy Rose’s Facebook posts on our Facebook page last week, so make sure you take a gander at all of that! Since we have heard so much lately about how Twitter and other social media outlets are the best way for politicians to communicate, we are going to go ahead and present to you some of our latest social media findings. If you haven’t had the chance to read our post on what a friend of the Yokel termed “The Hate Slate”, please take the time to do so. There we not only point out how very poorly written their “For Immediate Release” post was, but we also took the time to research and refute the claims within. The Hate Slate really doesn’t like it when we re-post their posts, read their press releases, or write anything about their awful ideas. According to them, that is bullying. LOL! If they want to believe that pointing out why they would be terrible members of our children’s board of education is bullying, we’ll just have chalk that up to one of the million things they are confused about. Let us first see how some of our candidates felt about the school walk out, shall we? Take heed liberals! Cindy will have you beaten into submission! Free speech does not apply to kids if they disagree with our point of view. These teenagers could not have come to a different conclusion than us (i.e.-we don’t want to get shot at school) without somehow being brainwashed by the evil liberal teachers. However, if a teenager does happen to subscribe to our point of view, they are heroes and critical thinkers who are the TRUE future leaders of these here United States. Also, Freedom of Speech ONLY applies to those who share our point of view because those who express a different viewpoint RIGHT IN OUR VERY FACES are somehow making us feel very bad and now we need our safe space! Please, continue posting, people! PLEASE! Yeah, how about that Maryland Case Search!? Go take a look folks! Of course people are going to look at what kind of person you are if you want to represent our interests! And that includes whether or not you have had any run-ins with the law! And of course we want those in charge of making educational decisions for our children to have a basic understanding of education (and to know how English works)! To us this requires ,at minimum, a college degree or some other kind of proof that shows you are beyond capable of analyzing research and passing budgets! (Yes, we know, elitist!) And #sorrynotsorry we are not going to be positive with people who have no business in the world running for the board of ed! You may be asking why we have chosen to spend so much time lately on the board of education race. These types of races don’t usually get a lot of press and in our opinion that is a huge problem! If rational folks don’t pay attention you wind up with board of education members who choose textbooks that treat slavery as just another world migration, or decide that creationism belongs in a science classroom, or try to ban books like Harry Potter. We can’t let these people on our school board. Pay attention and be vigilant! If you haven’t heard about Milo Y’s latest adventures, definitely enjoy some whimsical reading about his retracted CPAC invitation, kooky-stupid book deal that vanished into thin air, and termination from his cranky Breitbart covfefe production gig.